More so than tire compound/brand/type, the many smaller drift scenes seem to ignoring proper tire sizing. Today we will talk about tire width. 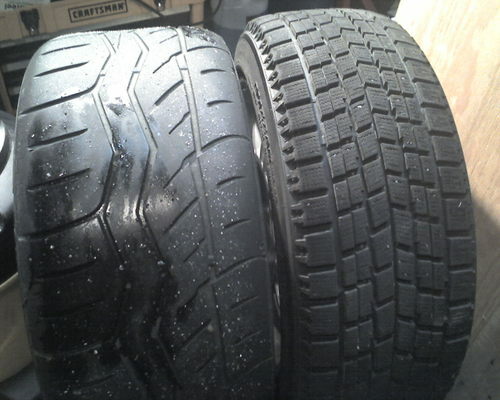 Originally, one would think that you want the skinniest tires possible. In reality, you want the widest tires you can possibly run. Below is the 2012 Formula D tire sizing regulations. These are simply based on vehicle weight (I believe with driver and car ready to rock). I'm not debating the specifics but I agree with the logic behind the rule. This rule is to level the playing field. You may run whatever horsepower you want but the limiting factor to your speed will be your contact patch. A 2100lb AE86 with and 700whp and 235mm tirse will drift at roughly the same speed as a -enter car that weighs ~3200lbs here- with 305mm tires and 1900whp. This will keep the heavier car from hooking and pulling away in a drift. The weight of the car on the tires will help dictate how much over all traction the car has. The hard and fast rule is that the more tire you can tuck, the faster you will drift (if you have enough power to spin the tires). As a result, I suggest newbies start with thinner tires and work up. It's also why you won't win any competitions on 195s. Finally, the implication of this knowledge can be vast. Our local competitions do not have these regulations. This means that the guy with more whp than you in the same chassis doesn't have an advantage if you run the same tires. But if he runs even 20mm tire more than you, that could be enough for him to pull away mid drift.